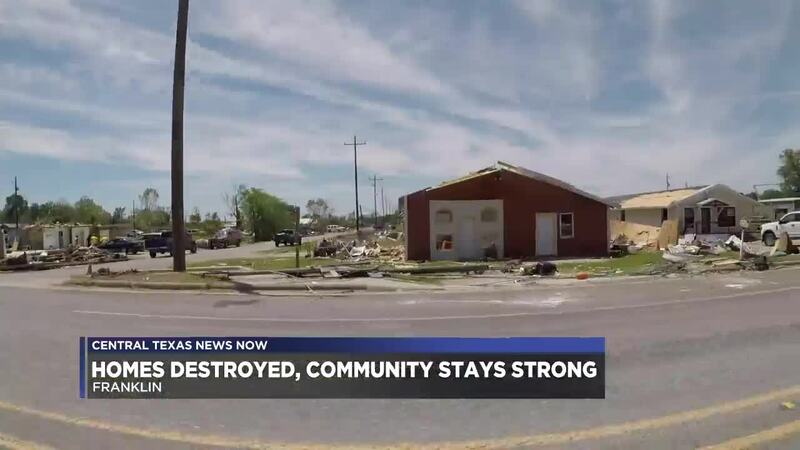 FRANKLIN, TX — Franklin is rebuilding after an EF-3 tornado tore through the community. On Thursday, the curfew was lifted. Homes and buildings were "totally destroyed." After the storms 4,000 people were without power, but as of 11 p.m. on Sunday, only 140 people are only without power. Officials said by 8 p.m. on Monday, power should be fully restored to all residents. For those who were unable to get into their homes, First Baptist Church opened up and Franklin United Methodist Church served as a triage center. A food truck on its way to a food truck festival stopped in Franklin and served and cooked food to residents who were unable to because of the storm. For monetary donations, you are asked to head to the South Star Bank in Franklin. Food donations are being taken at the Brazos Valley Food bank in the name Franklin Food Pantry. Clothing donations are to be taken at South New Hope Baptist Church. To donate to the Franklin Tornado Relief, you can donate through Facebook . As of Sunday morning, the fundraiser had raised more than $13,000 of its $20,000 goal. To donate to the Franklin Drive Thru Safari, you can donate through GoFundMe . As of Sunday morning, the fundraiser had raised more than $3,000 of its $5,000 goal.